September 26, 2011, Wilmington, DE – Corexcel named a 2011 Marvin S. Gilman Superstars in Business Award Winner. 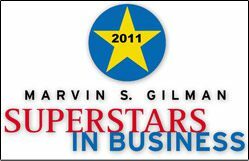 The Marvin S. Gilman Superstars in Business Award, named for one of Delaware’s leading small business entrepreneurs, honors businesses and non-profit corporations for their outstanding achievements and model approaches to business and management. The awards are presented to companies that have been in business for at least three years, are small businesses based on number of employees, and are members of the Delaware State Chamber of Commerce. Corexcel specializes in online training courses and materials, employee assessments and continuing education services. Through online courses, it helps clients develop personal and business skills and assist companies in hiring, assessing and training employees. Corexcel distributes products for three leading publishers: Inscape Publishing, Vital Learning and MindEdge, and since 2006, Corexcel has been a Diamond Distributor for Inscape Publishing, an honor reserved for those distributors in the top 1% in U.S. sales volume. The 2011 Superstars in Business awards ceremony will take place Nov. 9, 2011 at a luncheon at the Hotel du Pont’s Gold Ballroom. About Corexcel: Corexcel is certified as a small, woman-owned business by the State of Delaware’s Office of Minority and Women Business Enterprise, and is a Better Business Bureau accredited business. Corexcel is an Authorized Distributor of Inscape Publishing and Vital Learning products. Corexcel has been approved as an Authorized Provider by the International Association for Continuing Education and Training (IACET), 1760 Old Meadow Road, Suite 500, McLean, VA 22102.Corexcel is accredited as a provider of continuing nursing education by the American Nurses Credentialing Center’s Commission on Accreditation. For more information, please visit www.corexcel.com or call 1-888-658-6641. About Delaware State Chamber of Commerce: Founded in 1837 as the Wilmington Board of Trade, the Delaware State Chamber of Commerce has a long history as the largest, most influential business organization in the state. Through programs, legislative advocacy, communications and publications, small-business benefits and services and special networking events, the Chamber is continually providing an enriched environment for businesses and communities to grow. The Chamber provides unequaled service to the community of Delaware – one day and one business at a time.